Do you remember reading the cringe pages of your favourite magazines as a kid? Every issue of Mizz and Girl Talk featured the most embarrassing stories sent in by their readers and these always made for such fun (if slightly awkward) reading. 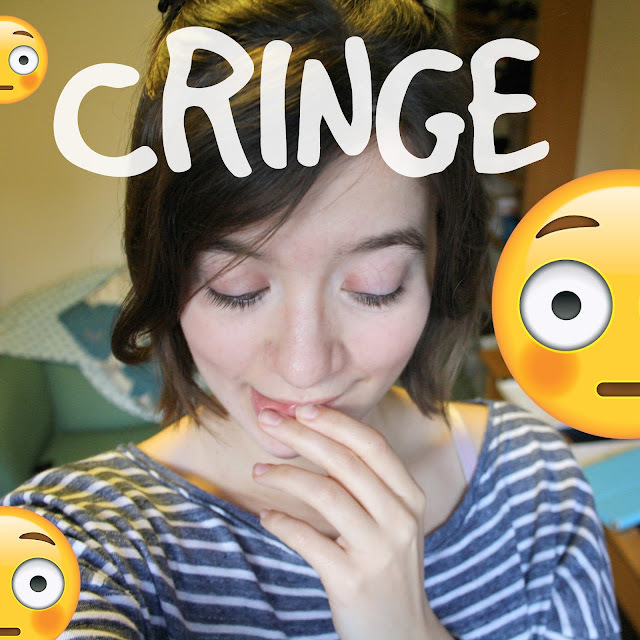 Today I've decided to re-live the fun of tween magazines by sharing some cringey stories of my own! A few other bloggers have joined me to share their howlers as well! Are you ready to get red-faced? Classmate: "I'm taking my driving theory test soon, I'm so nervous!" Me: "Don't worry, I passed with nearly full marks, it's all basically common sense!" Classmate: ".... I've failed it three times already." Filling up my car with petrol on the way to a party whilst wearing a short skater skirt. Just as I was walking to the kiosk to pay, a lady tapped me on the shoulder and was like "Love, you've got your skirt tucked into your knickers." Turns out I'd been flashing my arse to a petrol station full of van drivers for at least 10 minutes. I was home educated as a child (read all about that here), so if I ever needed help in an academic context, I'd always ask my Mum. However, once in the middle of my English class, I accidentally called my English teacher "MUM". That's understandable, right, if you're like 5 years old. But no. I was 18 at the time. Thankfully only my best friend Ryan heard me, and he's kept my secret to this day. Bless him. Picture this. I was 14 years old and I'd just spent the day at my then-crush's house. As I was about to leave, he picked me up and gave me a massive hug, squeezing my tummy. He hugged me so tight and I wasn't expecting it, so I accidentally let out a big fart! He was laughing for ages and I just wanted the ground to open up and swallow me. When I was working on an archaeological excavation last summer, the girls shower room opened directly into the entrance hall of our accommodation block. I'd just got out of the shower and was scurrying back to my room dressed only in a towel. I exited the bathroom to find the entrance hall packed, as one of the head excavators had just arrived. Our team leader spotted me, pointed, and shouted really loud "OH LOOK THERE'S ABBEY." And I just stood there in my towel and awkwardly waved! The poor guy didn't know where to look and he avoided eye contact with me for the rest of my time on the dig! Eeek. I had my first kiss when I was about 15. It was freezing outside and we'd been for a walk, so my nose was kinda drippy and snotty. He leant in for a kiss and I didn't know what to do, so I leant in too. When we pulled apart we both had my snot all over our faces! Safe to say that relationship didn't last long. My absolute worst embarrassing moment was when I came out of my uni exam and fell down the stairs. This happened in front of 200 odd people! I tumbled and landed in the fetal position. I was fine. Just ended up with a bruised ego. When I was quite young and visiting my Mum's friend's house, I once walked in on a Frenchman naked! If you thought that was awkward enough, he was shaving his bits at the time! What is your most embarrassing moment? Share in the comments below - if you dare!